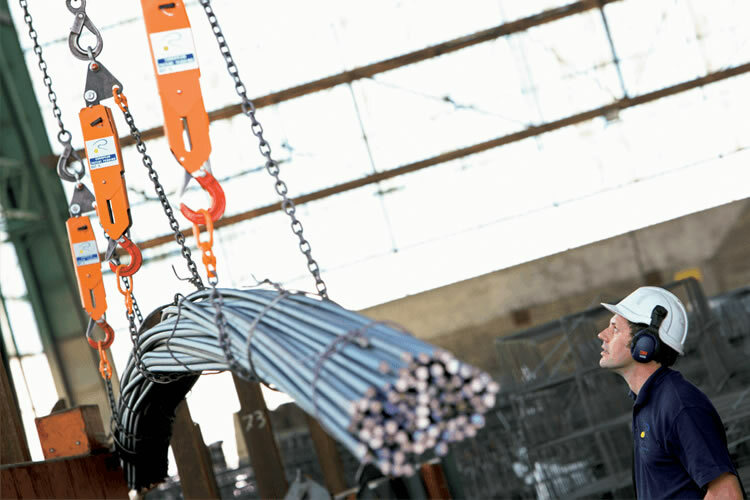 Coil Spider is a safe and small lifting device that, due to its up-to-date features, can hook from the outside rolled and drawn coils (either rewinded or not). 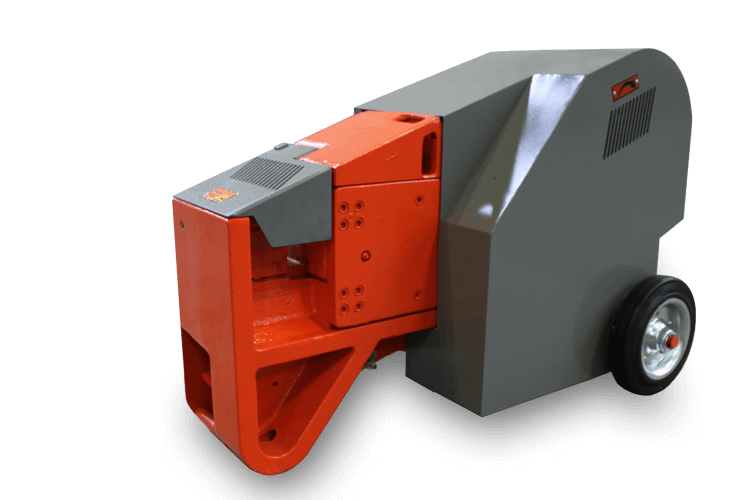 The hook mod EASY is a device allowing the handling of any loads in a fully safe condition. 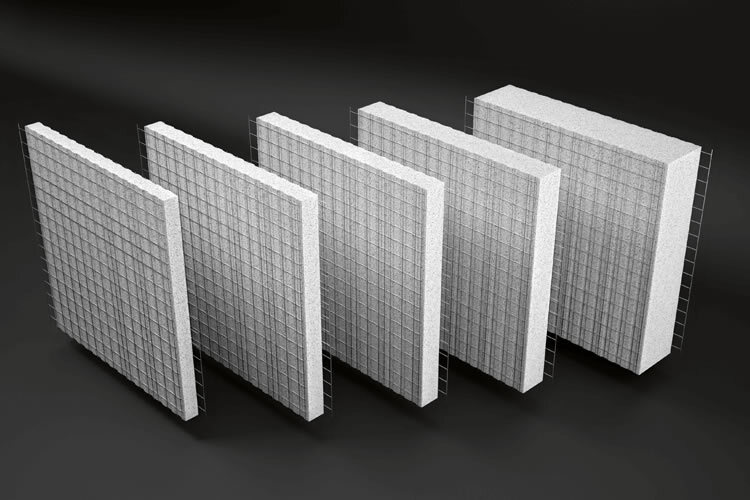 IDEA assembles cages by means of the patented 'Schnell System' (Patented). 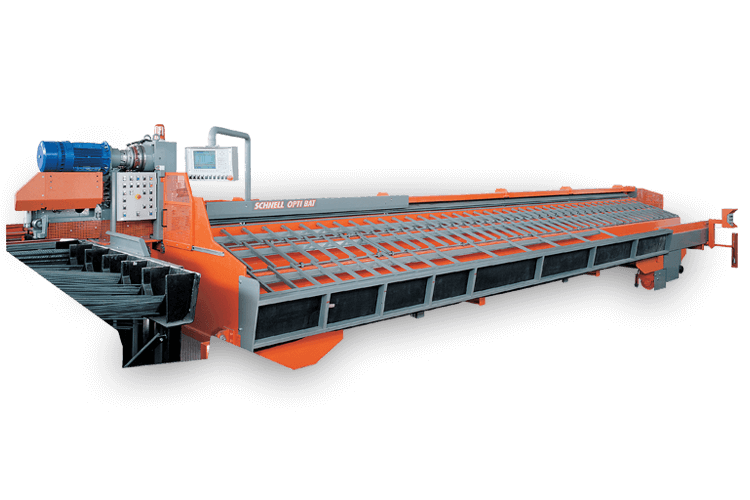 Thanks to its innovating system, Mega Genius takes, counts and moves the bars for shear-line feeding in a completely automatic way. 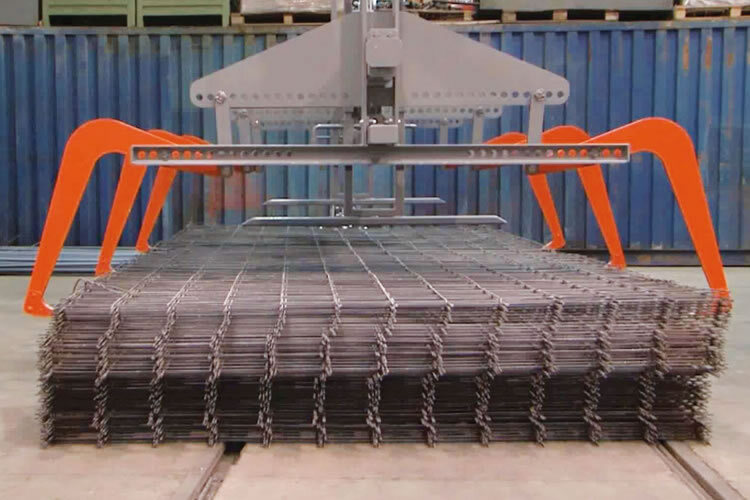 Mesh Spider is the lifting equipment to move electro-welded mesh panels which can hook mesh bundles from the outside. 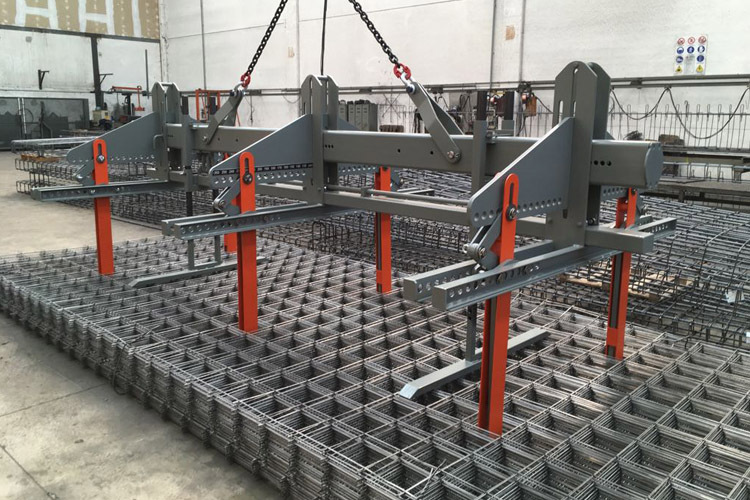 Mesh Spider is the lifting equipment to move electro-welded mesh panels which, thanks to its innovative patented hiding guns, can hook mesh bundles from the inside. 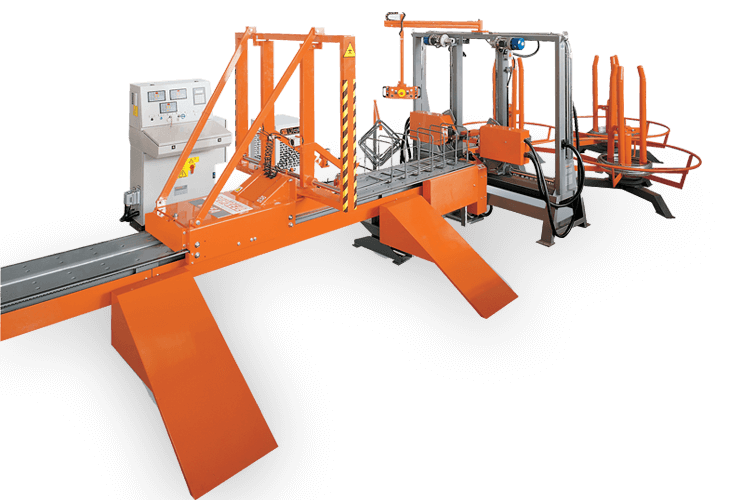 Electro-mechanical automatic cutting bench with 3 transfer roller conveyors. 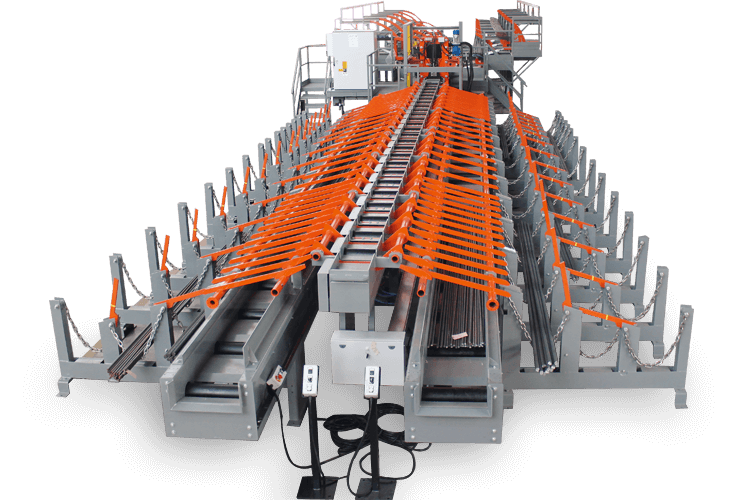 Electro-mechanical automatic cutting bench with 6 transfer roller conveyors. 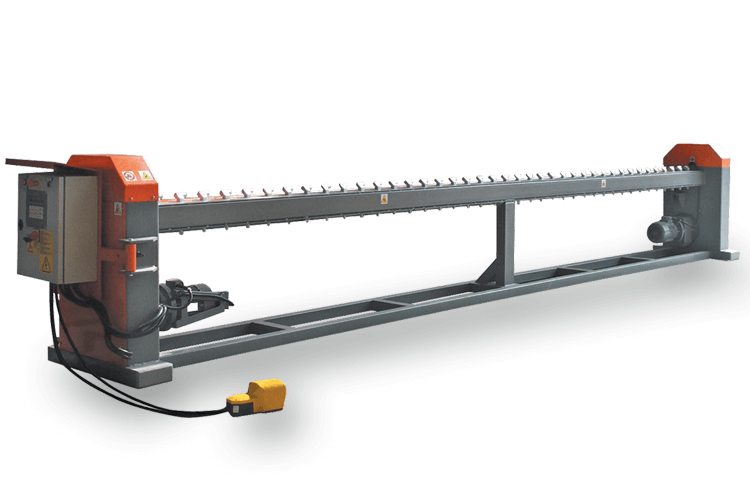 Shear for fast bars cutting. 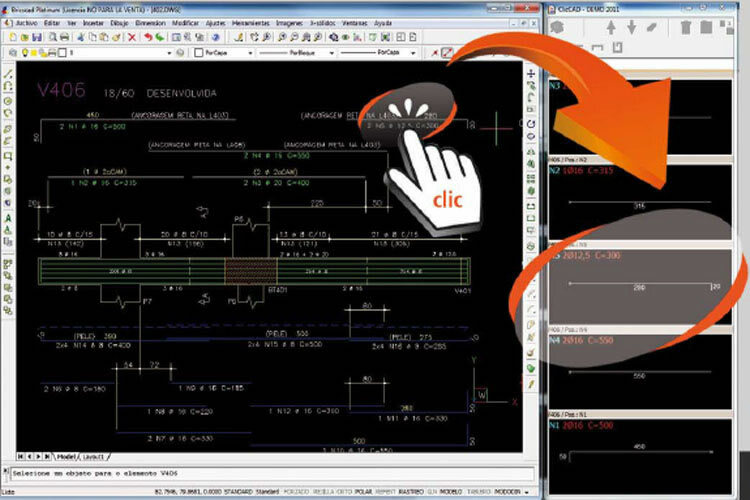 Software module that allows automatically importing the data of the longitudinal beam reinforcements according to the working drawings. 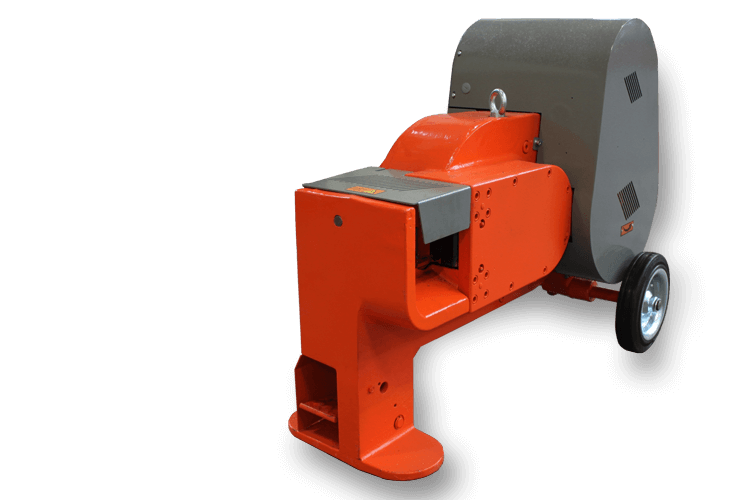 Stirrup bender and bar shaping machine from coil with 2 bending heads for the production of stirrups and shaped wires with bends at both ends using wires up to Ø 16 mm (#5). 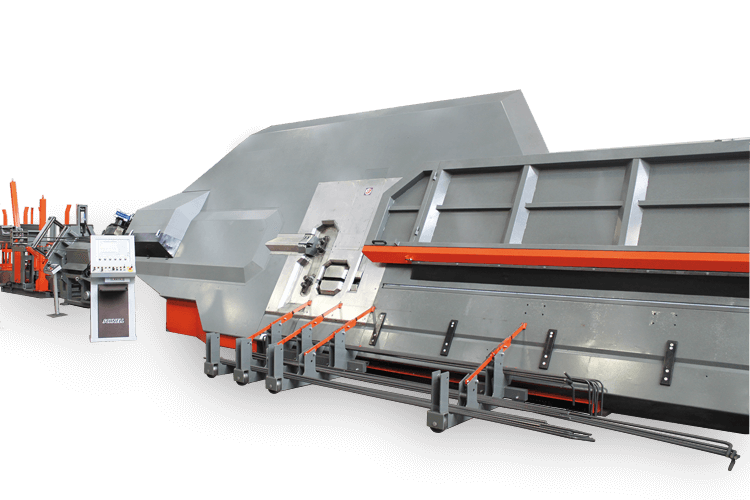 Stirrup bender and bar shaping machine from coil with 2 bending heads for the production of stirrups and shaped wires with bends at both ends using wires up to Ø 20 mm (#6). 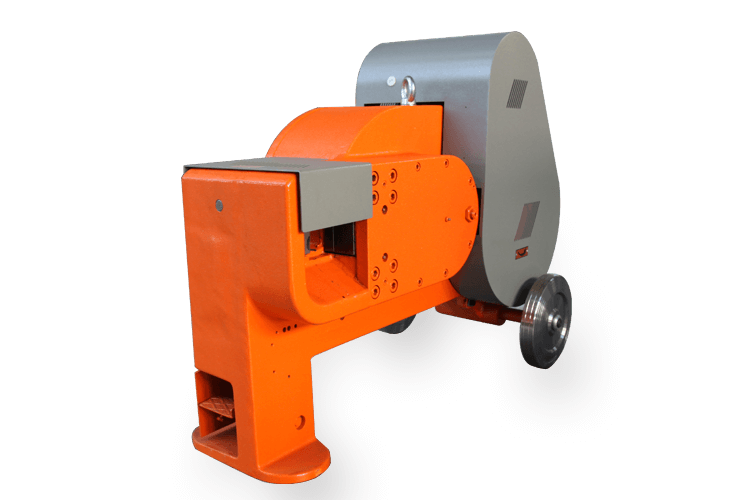 Stirrup bender and bar shaping machine from coil with 2 bending heads, allows to produce stirrups and shaped wires with bends at both ends using wires up to Ø 25 mm (#8). 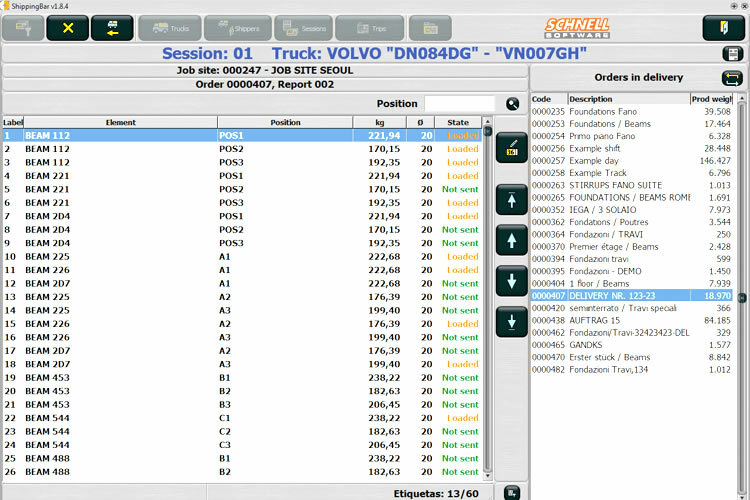 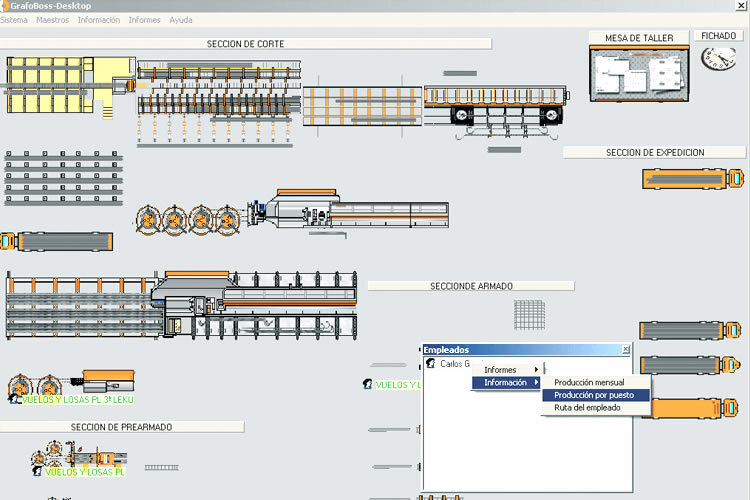 Production supervision software that shows the job execution status in real-time and allows managing the operators and obtaining the real production statistics also for manual machines and by operator. 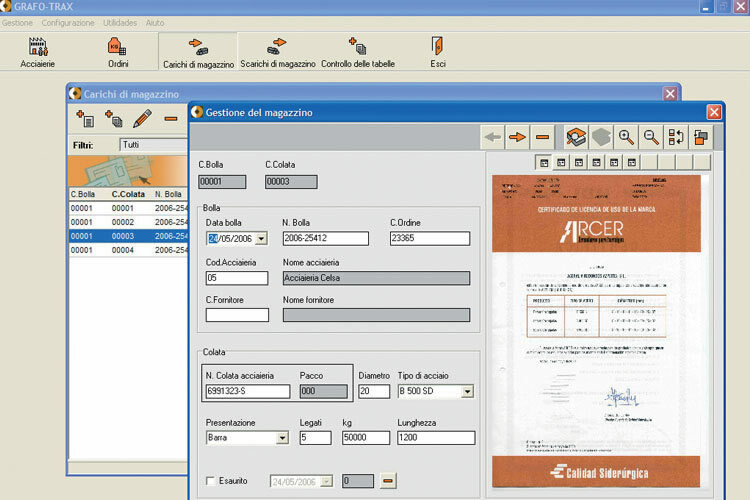 Software module that allows issuing quotations, notes and invoices for the rod orders managed with the Graphico software. 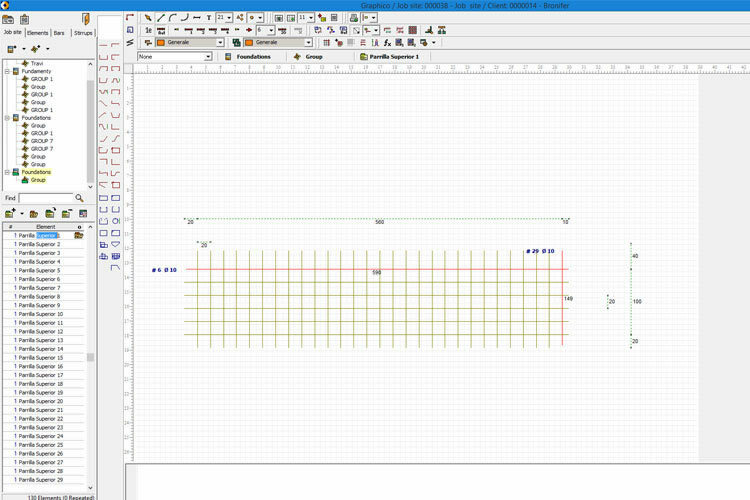 Grafo Mesh simplifies the production of meshes, floors, walls and other items having longitudinal and transversal wires. 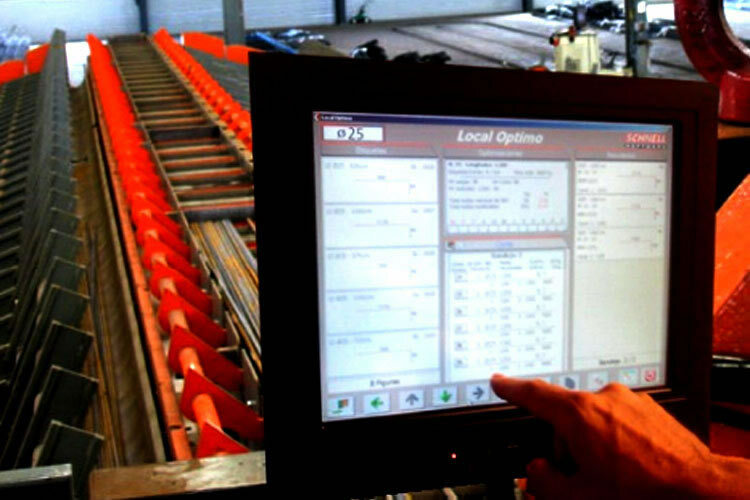 Software module which allows the traceability of the material required for the quality managenets and the 'real time' reception of the casting used in the different machines. 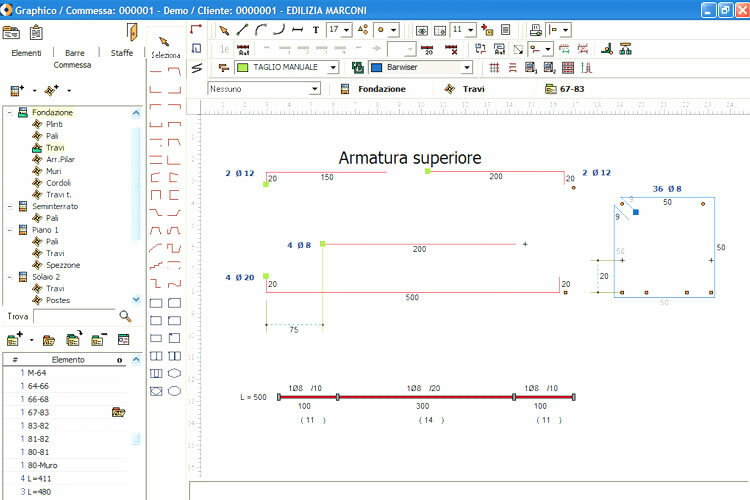 Graphico is a flexible, powerful design system for the development of rods and is easy to use and learn. 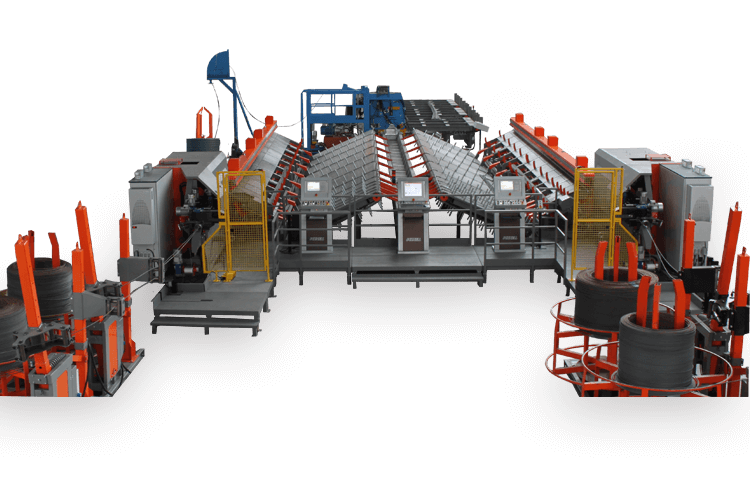 Multi-rotor straightening center using coils up to Ø 20mm for the production of straight bars. 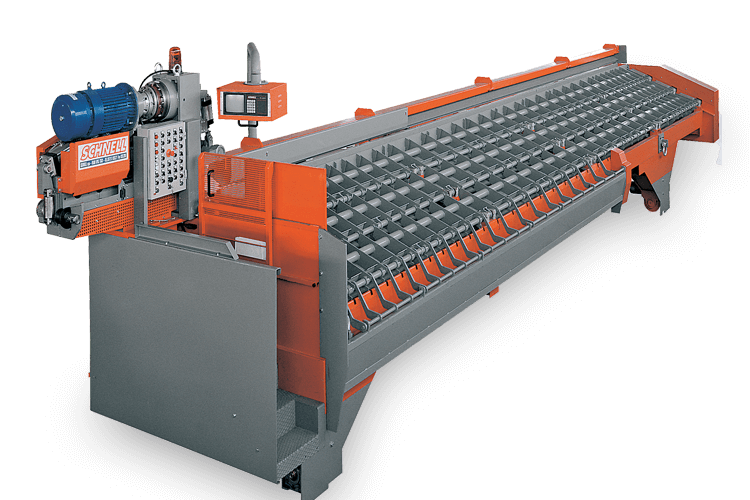 Multi-rotor straightening and shaping center using coils up to Ø 20mm for the production of straight bars, large stirrups and shapes with bends on both ends. 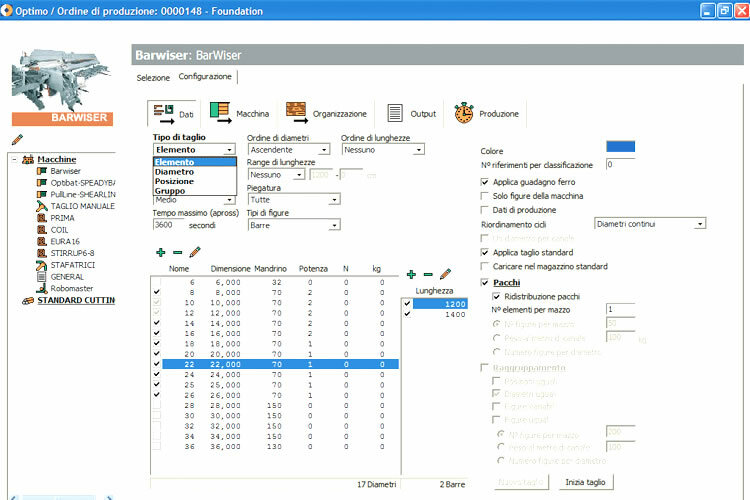 Local Optimo is an important optimization software allowing to work on the machine’s computer. 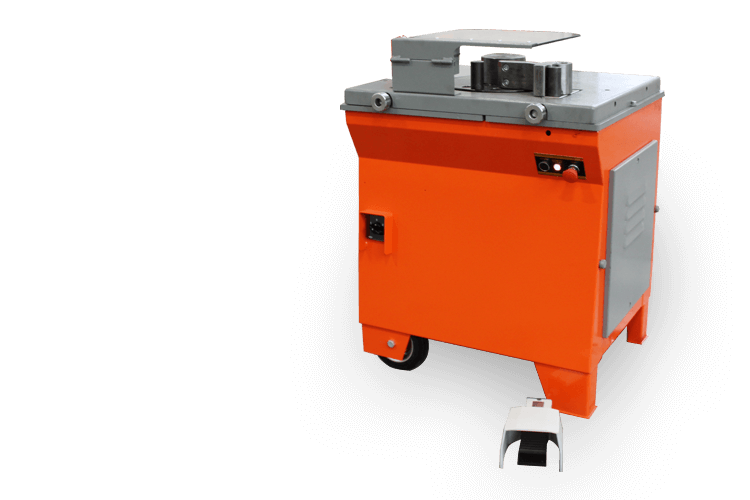 Electro-mechanical automatic cutting bench equipped with 2 side folding pockets. 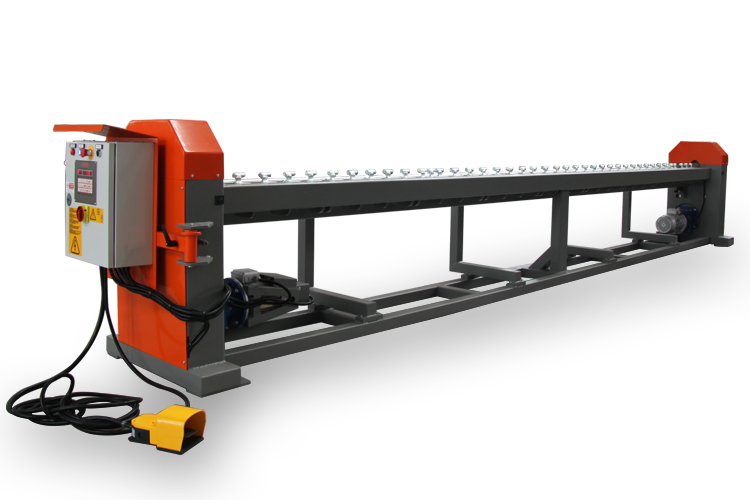 Electro-mechanical automatic cutting bench with 3 transfer roller tracks and a second additional rebar conveyor. 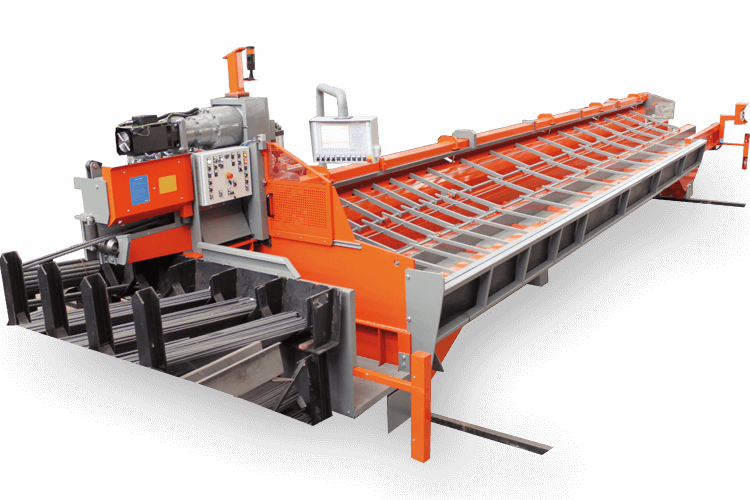 Electro-mechanical automatic cutting bench with 5 transfer roller tracks and a second additional rebar conveyor. 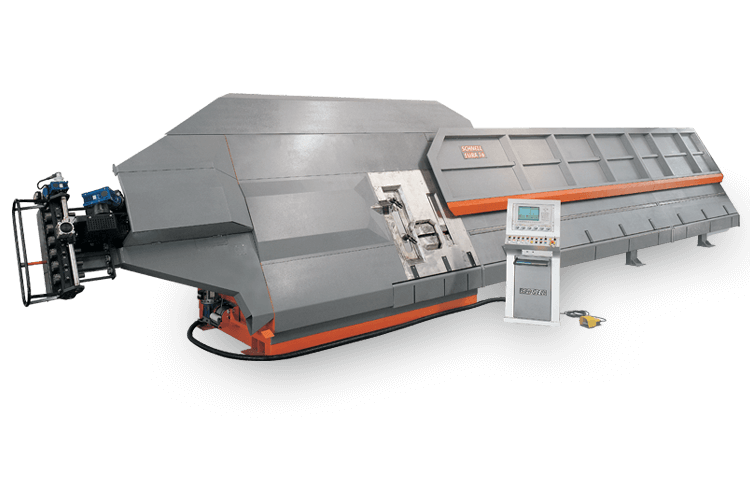 Integrated rod optimisation system for cutting and profiling machines. 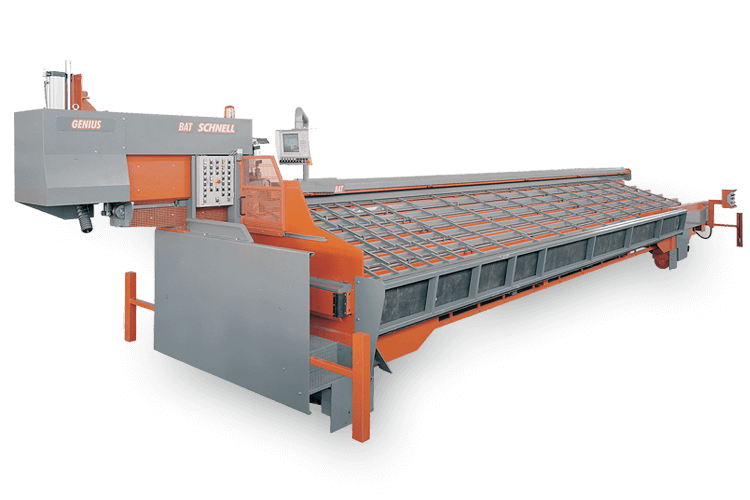 Bending machine for bar processing. 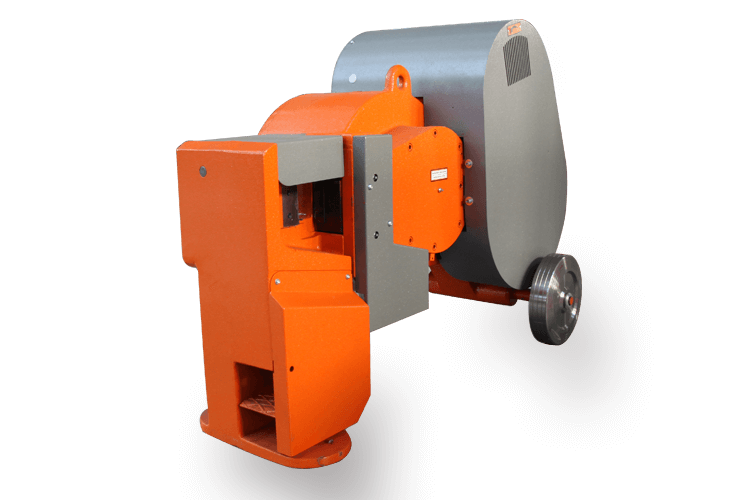 Automatic mesh bending machine, equipped with double gearmotor, fast fitting pins and switch for 3 mechanical programs. 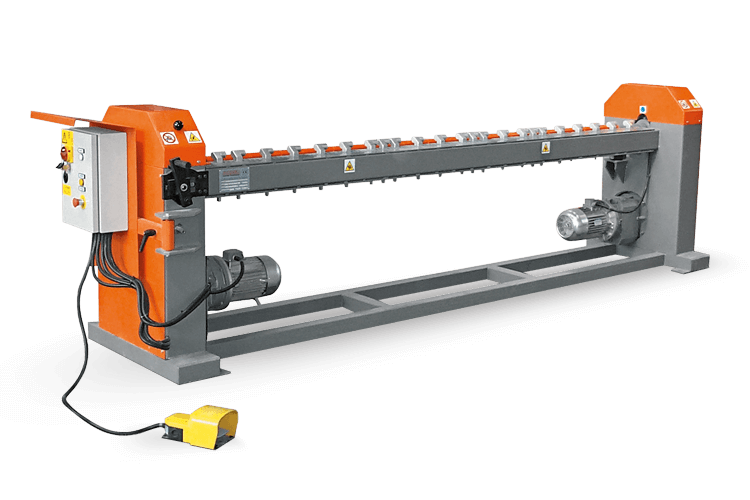 Automatic wire straightening and cutting machine, with rollers, for the production of cut-to-size wires up to Ø 20 mm (#6). 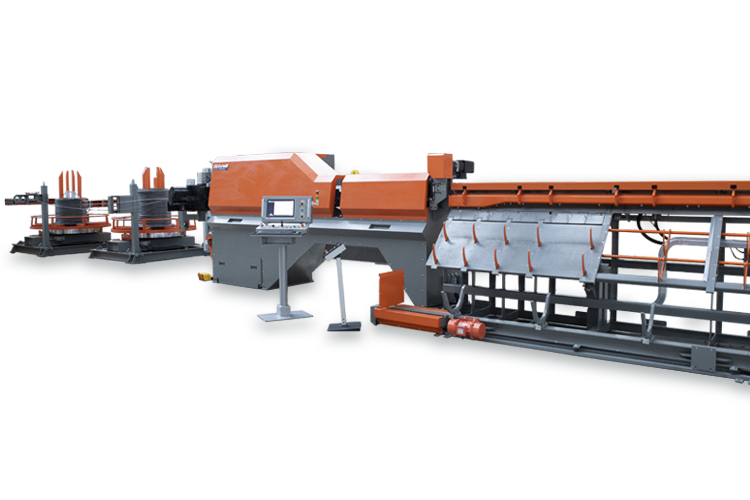 Fast automatic wire straightening machine, with rollers, for the production of cut-to-size wires up to Ø 13 mm (#4), equipped with Senso Technology. 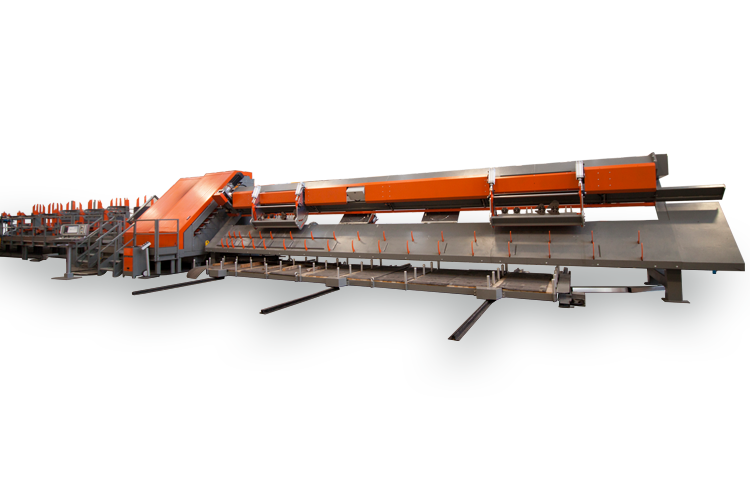 Integrated plant to cut and store pre-cut bars made of fast automatic straighteners with rollers (such as RETA) and coil processing up to Ø 20 mm. 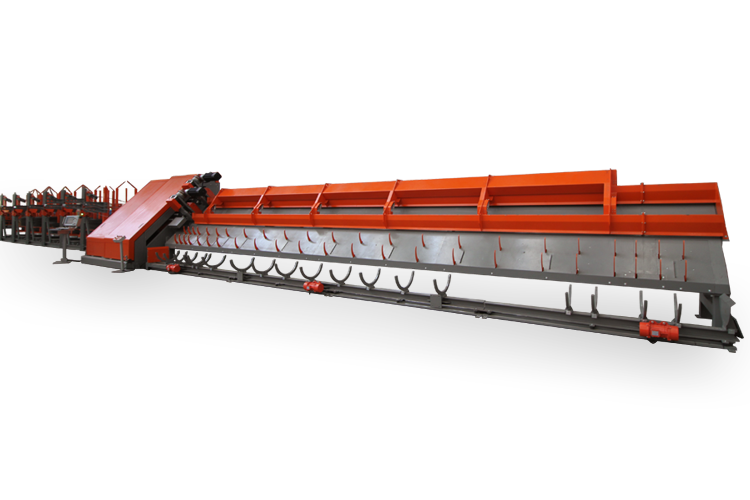 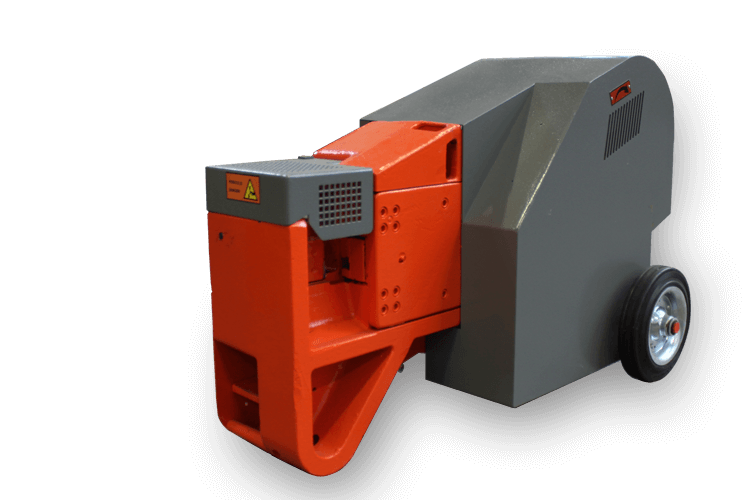 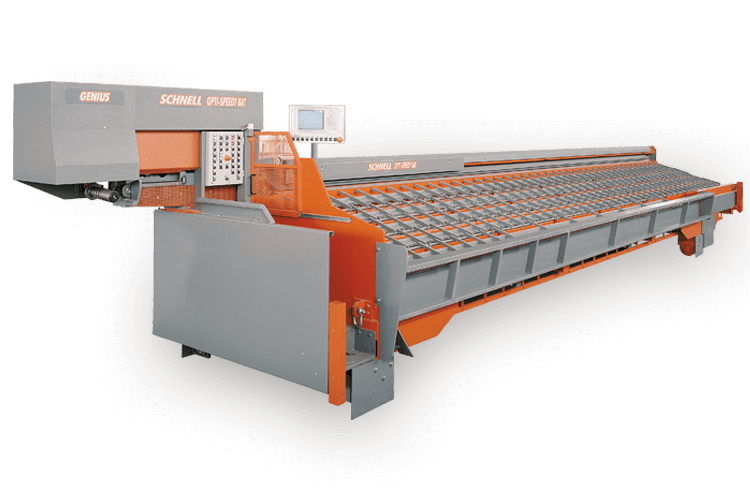 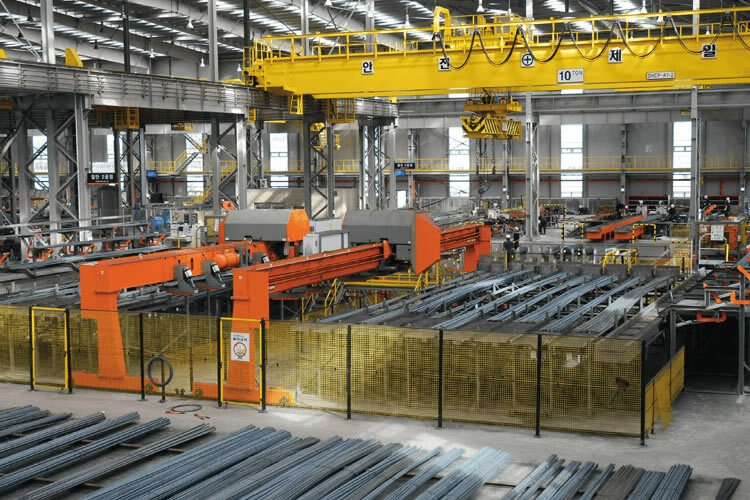 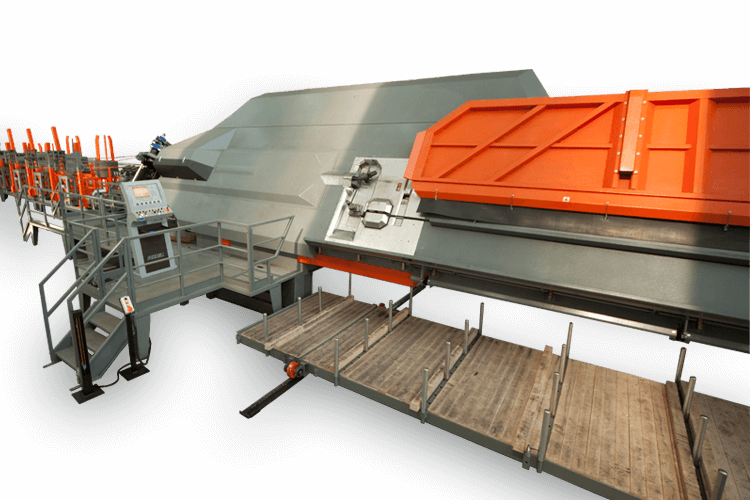 Integrated plant to cut, optimize, stock and handle the bars, suitable for mass productions, based on a shear CGS 500, mounted on a mobile frame, with blade of 500 mm (20''), VMT measuring and cutting track to cut the bars to size and unload them on the right or left. 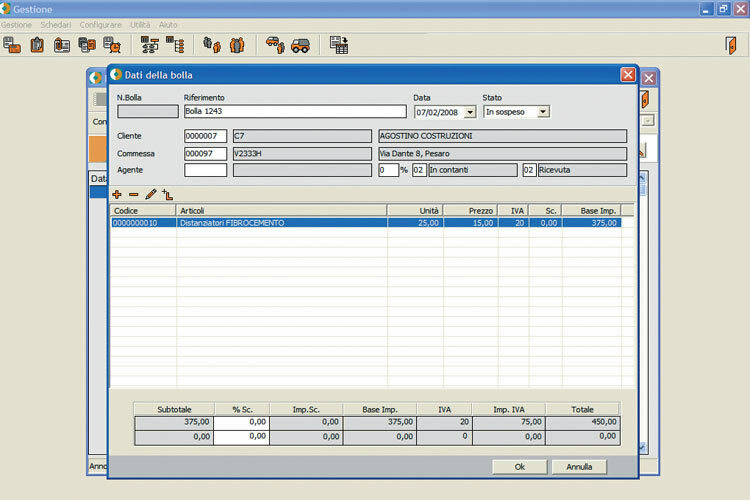 Shipping Bar manages orders shipping and deliveries. 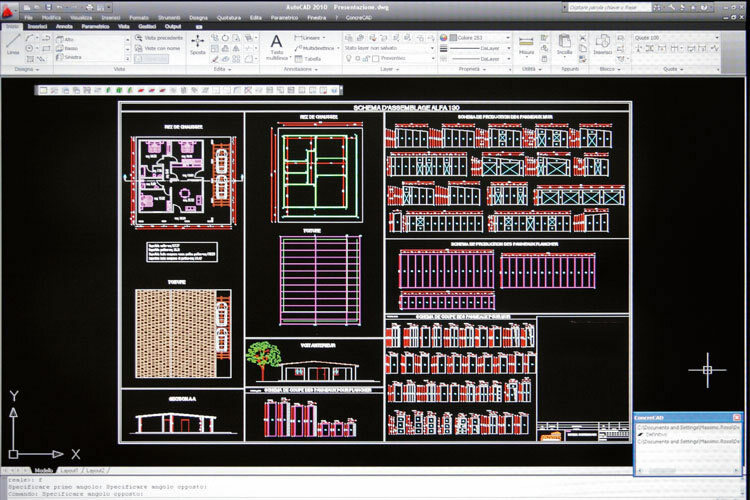 We love being creative, amaze and look forward! 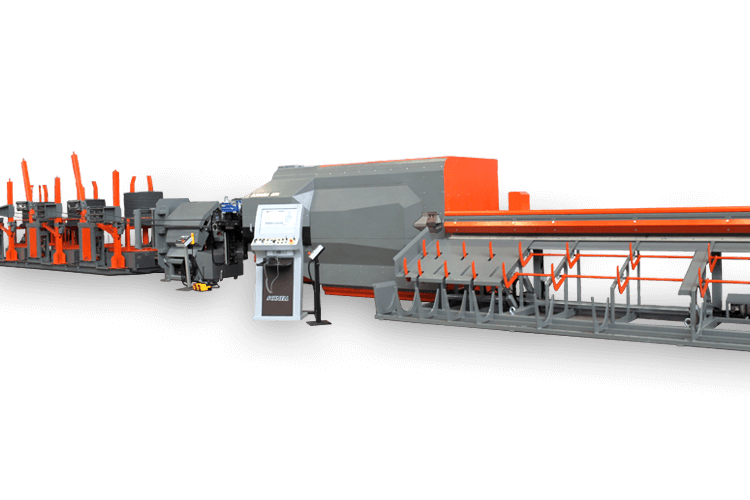 OPEN HOUSE 2017: THANK YOU FOR YOUR VISIT! 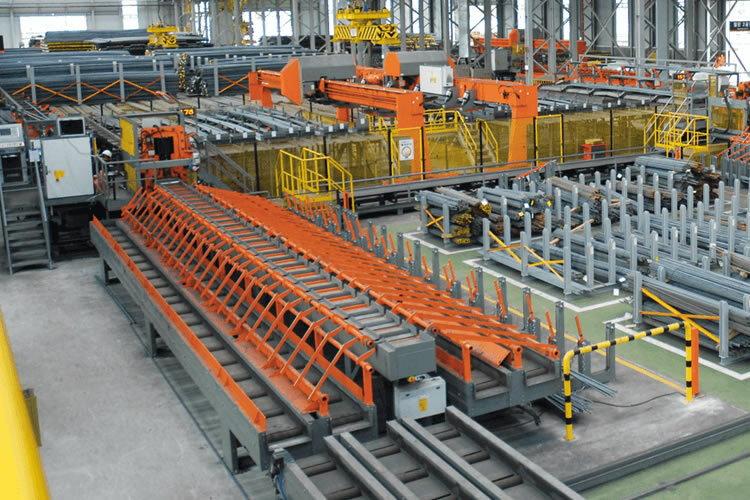 IPC 40: Plant for radius bars with bends. 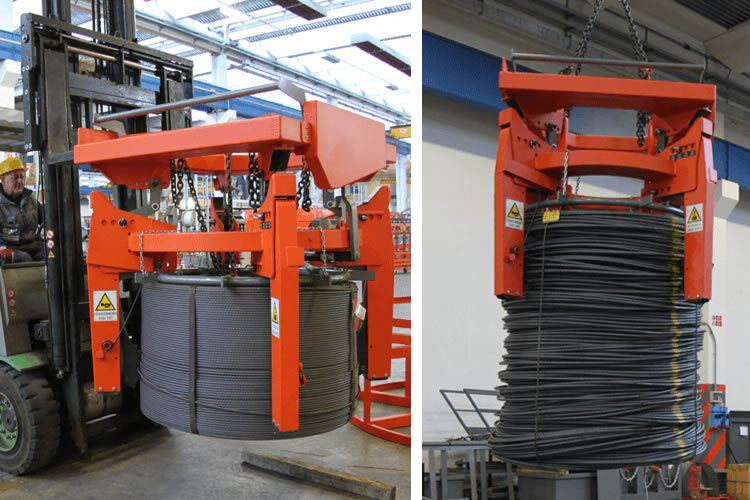 Power and Flexibility.